Posted on 10/06/2011 by Jensen Moore, Ph.D. The PR 324 students have completed their sales letters, process brochures, and marketing plans. They are now poised to meet with owners of local Morgantown businesses to pitch the idea of using SCVNGR to attract WVU college students to their establishments. This is all part of a service learning project for the Public Relations Writing and Applications course offered by the P.I. Reed School of Journalism. It is part of a joint partnership with SCVNGR and the International Town and Gown Association. The goal? To improve the local economy through mobile gaming and social media. 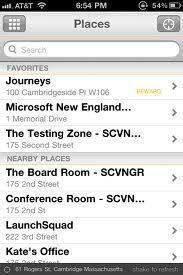 SCVNGR is a geolocation-based smartphone game where users can “check in” to different locations they frequent and earn points toward something of value from different businesses. Clients such as Coca Cola, Buffalo Wild Wings, Gamestop and most recently Duncan Donuts are using SCVNGR as part of their promotion strategy. Even the North Carolina State Fair is getting in on the action, by conducting a deep-fried SCVNGR trek through the fair. This week the PR 324 students have to come up with interesting Challenges, Rewards and Treks for their clients. Each team should present different ideas to the client (as no one wants to have the same promotions as everyone else, right?). 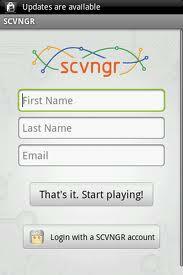 This is going to take ingenuity, creativeness and an engagement mindset as SCVNGR is about interaction through gamification. I am really excited to see what each team (retail, services, entertainment, restaurants, pubs/beverage) is going to come up with for exciting Challenges and Rewards. I think some of them are even planning Treks (whoo, hoo a Morgantown social media pub crawl:) to get students moving among local businesses. Should be pretty interesting. Furthermore, I am excited to see how each team plans to get more WVU students to download the FREE SCVNGR application to their smartphones. Stay up-to-date on all the cool freebies, discounts, and rewards you can earn by checking-in to local businesses. Follow the students on Facebook and Twitter (@pr324_wvu) as they add new Morgantown clients. 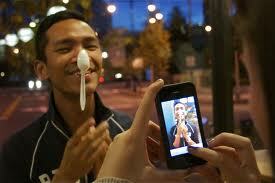 As you can see, this service learning experience has many real-world applications for the PR students. Over the next few weeks the students will be creating media pieces regarding the project. Keep your eyes peeled for media coverage of this unique project!